Southampton has recently stepped up its game in terms of food – the new Watermark West Quay opened late last year and the introduction of plenty new restaurants has made a world of difference. I am a huge foodie and the sheer amount of choice we have now means the new development is basically heaven! We’ve had a lot of mainly London based restaurants opening which is great and I’ve frequented Byron far too many times I’d like to admit. Franco Manca is also a firm favourite and, if you’re after great American food, ‘The Diner’ is where you’ll want to visit. Tucked away at the end of the strip of restaurants on the terrace, and below the West Quay North entrance, The Diner sits proudly and the glowing neon signs mean you can’t miss it. It’s a lot bigger than it looks from the outside and the seating is ample – with the choice of booths as well as tables. Graham and I attended their press night last week and the food went down very well indeed. The restaurant feels like a very trendy bar, with neon lights inside and beautiful coloured tiles. The ambient lighting and pipes and tubes that line the ceiling give a really modern, industrial feel. There is a huge amount of choice on the menu, from burgers and hotdogs, to chili, ribs and sandwiches. We had all the starters very kindly delivered to our table, with my personal favourites being the classic American tater tots and the buttermilk chicken strips. For the mains, our table was full of burgers, a side of mac n cheese, sweet potato fries and I had a ‘BCC Dog’ – a beef frankfurter topped with their chili con carne, cheese and bacon. The portion sizes are extremely generous and everything is served in those classic plastic baskets you see in the movies. I also met Lana that night, who was there with her brother Max, and we had a great night chatting and talking blogging. It’s always so nice to meet someone new and gel instantly! We were served by Callum who was wonderful – he let us take our time when ordering and was attentive and polite. A big thumbs up to all of the staff, who were extremely friendly and helpful all evening. We popped behind the bar at one point and made our milkshakes which was so much fun! Rebecca helped us out here, and we could make any concoction we liked. The Diner uses ice cream made in Italy and have so many flavours available, including Hazelnut, NY Cheesecake, banana and peanut butter. We made our shake with vanilla, banana and strawberry, mixed with malt and it was the perfect finish to our meal. I also may have had a chocolate milkshake during the meal which I can confirm was delicious too! 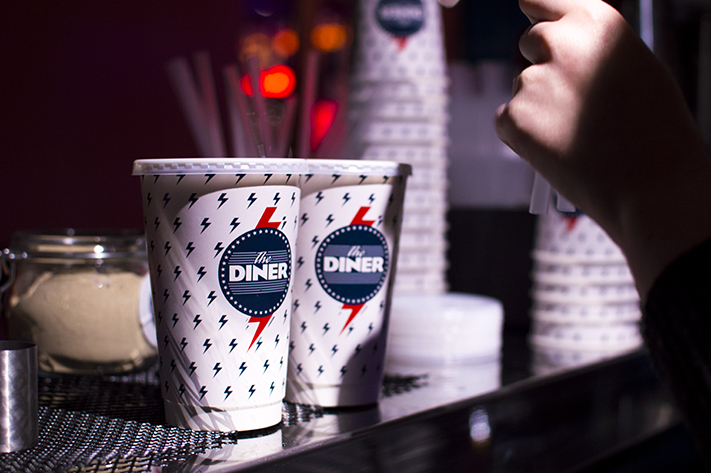 I’d definitely recommend The Diner if you’re after some classic American grub with a huge amount of choice – perfect for families and foodies alike. The prices are very reasonable, especially as the portions are massive. I’m looking forward to heading back and trying the pancakes I spied on the menu! A huge thanks to the PR team for organising and inviting us along.